Published on 24 January 2012. 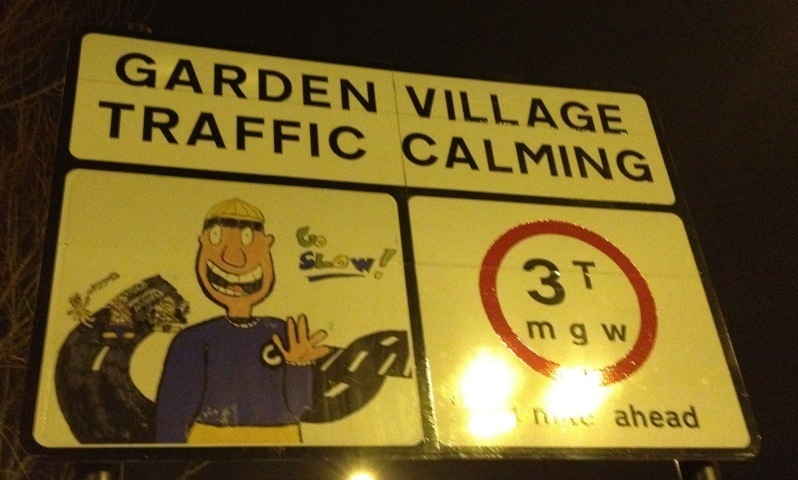 If I may be permitted a moment of grumpiness: the vogue for road signs drawn by children is irritating. This photo shows but one example from my neighbourhood. When you consider the care and attention paid by Margaret Calvert et al in the design of clear, readable road signs, the idea of having difficult to read distracting scribbles pasted about the place seems absurd. Yet, I’m sure I’ve read in the past that such signs actually reduce traffic speed and accident rates: still, it doesn’t mean I have to like them. This 1,495th post was filed under: Photo-a-day 2012, Gosforth, Newcastle-upon-Tyne, Transport.